Sets off with passion and conviction to establish the cause of the striking miners and the trajectory that followed … As a slender pocket-size summary of all the key events and important issues, this book cannot be matched in my view. This unique first-hand account of the miners’ strike for jobs is published to mark the 25th anniversary of the dispute that changed Britain. 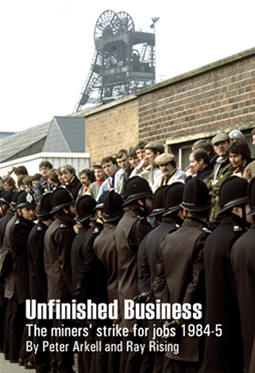 The authors were photographers during the strike, when the National Union of Mineworkers and pit communities confronted the Thatcher government and the state. Drawing on new sources as well as their own experiences, Peter Arkell and Ray Rising draw out the significance of the longest-ever mass strike in British history. They reveal how the Trades Union Congress and Labour Party leaders betrayed the strike and expose the role of the secret state in trying to undermine the NUM leaders. Now that the economic and financial crash is joined by a deep political crisis within the British state, the opportunities are present for picking up where the miners were forced to leave off, the authors say. Unfinished Business contains 80 vivid photographs which help bring this titanic struggle to life. Many of the photographs are published for the first time. "This is a book of images showing events which we will never see the likes of again in our lifetimes. They show proud mining communities standing unbowed, they show the unity and strength of those who were part of a nationalised industry, and they show the lengths a capitalist government was willing to go to destroy their communities and their industries. In my opinion this book is an excellent pictorial record of one of the most controversial years of mining history."